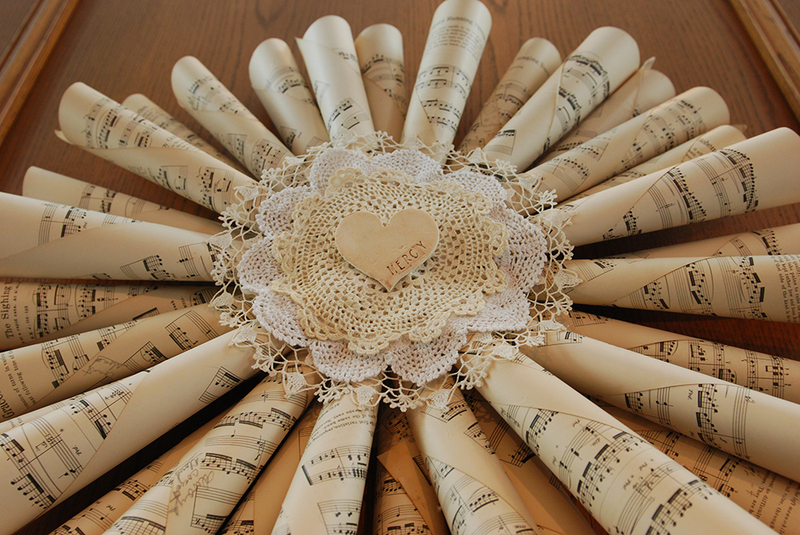 Sheet Music Wreath - Jill Ruth & Co. So, yesterday, I went to the store room determined to clean and organize it. Oh look, I made a wreath instead! When I dug out the boxes of music...I decided to seize the moment. There are so many tutorials and different ways to do this out there on the internet, you can cruise around to find what works for you. Without any how-to pictures I'll tell you how mine came together. ►Punch two holes for a hanger. 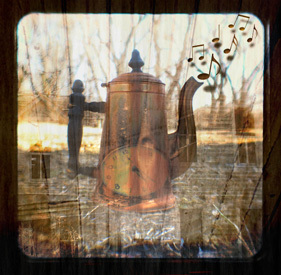 ►Roll the sheets of music and using a low temp glue gun, use a dab of glue to hold close. 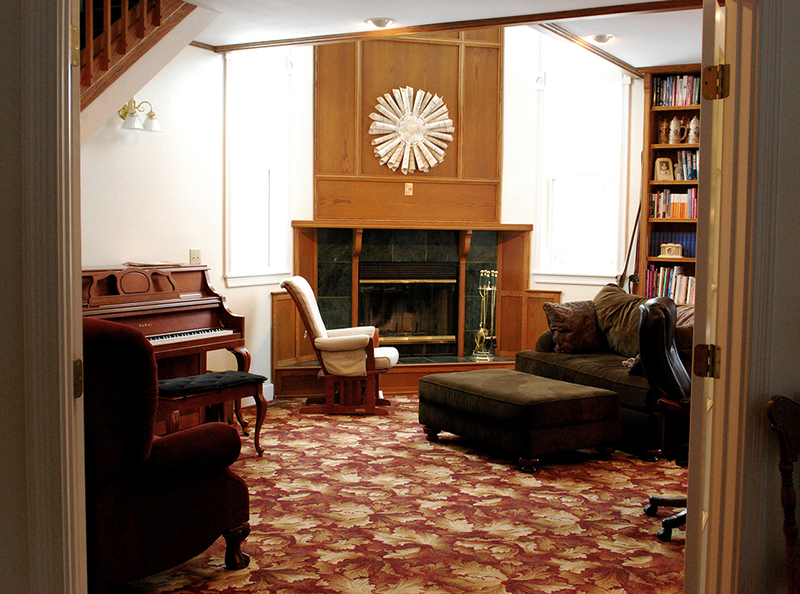 I used two books of pianoforte music. It is the most glorious looking music out there and fairly sturdy pages. Except that they are so old they are a bit fragile. I am a little sad that I used these books, but they have been in storage for probably 15 years and there isn't much of a market for them as sheet music is everywhere. At least they are being enjoyed again! ►Position the rolls to your liking on the cardboard backing and glue lightly. When you are happy with it, go back and add more glue. I really thought the low temp glue gun worked well. ►Add a cord hanger to the punched holes. 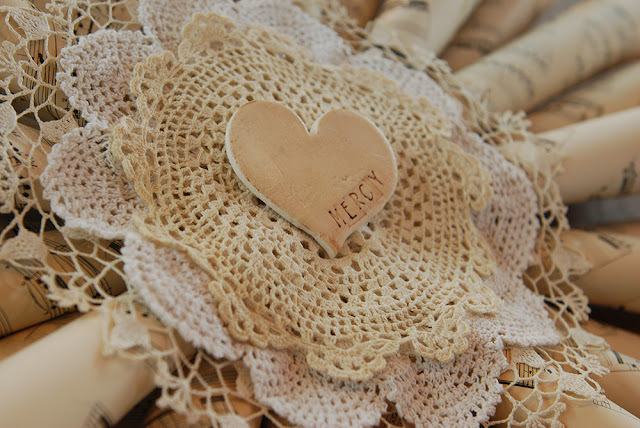 ►Audition doilies and medallions (how about a big broach?) for the center embellishment. I had this heart (from my clay project) laying on the sewing room table while I was making this and there you go...found a home for it! ►Again using the low temp glue gun tack the doilies and center embellishment down. 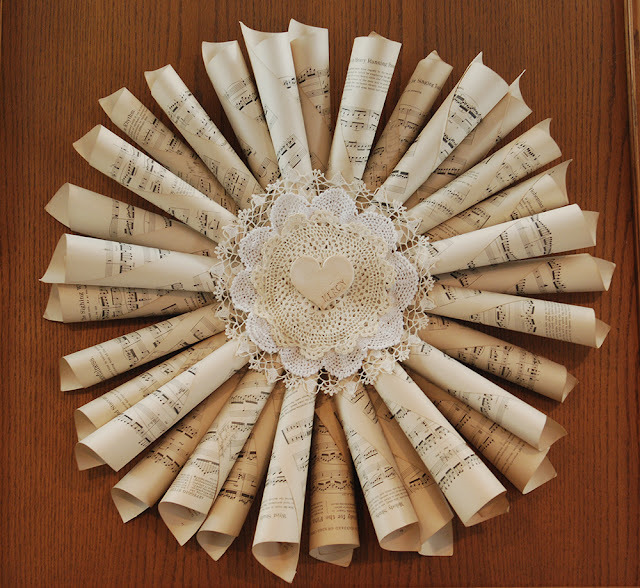 ►Before I started I measured the space where I was going to hang this so I knew if I should trim down the music sheets or not. So why didn't I take it down to take pictures of it?? I still have a store room to clean! I am really happy with the layered doilies in the center! I appreciate the woman (unknown to me) who perfectly blocked and starched the really fine one in the back because it was like that when I bought it years ago. Did you notice we haven't decorated the mantle since putting the Christmas decorations away?! So it goes. It's so pretty, Jill! And much more fun to create than clean up and organize.